Is There A Difference Between A Medium, Psychic, And Tarot Reader? Looking for an expert in the psychic world can be an overwhelming experience. It’s especially difficult if you’re going through a tough time and just want a reading but don’t know what type of advisor to speak with. Take a look at any company offering psychic services and no doubt you will see Mediums, Psychics and Tarot card readers all willing to provide you with support and guidance. Is there really a difference between them and the types of readings they offer? Mediums often work platform in Spiritualist churches or other venues where groups of people can gather. Due to the highly emotional nature of their work many also offer private one-to-one sessions. Although most are gifted psychics they will not include predictions or information on future events in their readings. A medium is a channel between the earthly plane and the spirit world and their gift is to share messages from loved ones who have passed over. In doing so they offer comfort and reassurance to those who have experienced loss and give proof that ‘life’ continues beyond our earthly existence. If you want to receive a message from someone in the spirit world remember that a medium is not able to call forth a particular person. They are only ever able to communicate with the spirits who approach them. This can be frustrating especially if you really wanted a message from a beloved Great Aunt. However it may be that your Grandfather is the one with a meaningful message for you. Keep an open mind and trust your loved ones are giving you the message you most need to hear. In order to verify their connection with the spirit world mediums will offer information specific to a particular person. They may describe an aroma or scent, quote a familiar phrase or mention a favorite item of clothing or jewelry. This is important as it helps ensure the spirit’s message is shared with the right person. A medium can receive messages in a variety of ways including Clairaudience (hearing the voice of the spirit), Clairsentience (sensing or feeling the spirit) or Clairvoyancy (seeing the spirit). Psychics possess highly developed intuitive skills and extra sensory perception. Unlike mediums they use these gifts to help predict future events. If you are looking for guidance about a particular problem then a psychic reading is a good way to get to the heart of the matter. Most psychics are Clairvoyant, Clairsentient or Clairaudient but many are proficient in at least two. No matter how the messages come through they will help shed light on your current situation and give guidance about the best steps to take to move forward. Some may even use psychic tools such as Tarot cards, Crystals, Runes or Pendulums to strengthen their insight. Occasionally a psychic may pick up on the spirit of a loved one during a reading. They may sense someone around you but this is very different to the heightened connection a medium has with the spirit world. Most Tarot card readers are psychic and simply use the cards as a way to expand their vision. It is possible to read the cards without having any psychic ability but when combined with second sight a Tarot reading is extremely powerful. Skilled Tarot readers usually have a preferred deck and will have a variety of card spreads on hand for specific questions. Decorated with distinctive imagery each card has a unique meaning. When drawn from the deck upside down or grouped with other cards this meaning expands and the resulting spread reveals detailed information about your situation. How the cards are interpreted will vary between readers. Tarot readers have a thorough understanding of traditional meanings but over time they develop their own personal connections with each card. This gives each reading a personal touch and allows the reader to look even deeper into whatever may be troubling you. This post is filed under Becoming a Psychic, Psychic Networks, Psychic Readings and tagged Mediums, online psychics, Psychics, Tarot Readers. Built in 1832 and owned by socialite Madame Delphine LaLaurie and her husband, Dr. Louis LaLaurie, the house was the reported setting for vicious cruelty against the couple’s slaves. In April, 1834, a fire broke out in the LaLaurie residence on Royal Street, starting in the kitchen. When the police and fire marshals got there, they found a seventy-year-old woman, the cook, chained to the stove by her ankle. She later confessed to them that she had set the fire as a suicide attempt for fear of her punishment, being taken to the uppermost room, because she said “Anyone who had been taken there, never came back.” As reported in the New Orleans Bee of April 11, 1834, bystanders responding to the fire attempted to enter the slave quarters. The bystanders broke down the doors to the slave quarters and found seven slaves in various states of mutilation – suspended by the neck, with their limbs apparently stretched and torn from one extremity to the other. At one point actor Nicolas Cage owned the home, and while he said he never saw any ghosts, he too felt the curse of the home; losing the property to foreclosure in 2009. 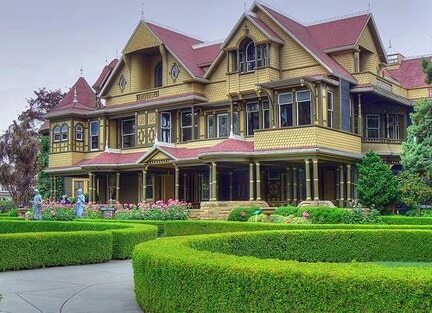 The residence of Sarah Winchester, widow of gun magnate William Winchester, this house was under continuous construction from 1884 until Sarah’s death in 1922. The 38 years worth of round-the-clock construction cost an estimated $5.5 milllion (over $70 million today). The result: a maze-like structure that includes twisting and turning hallways, dead ends, secret panels, a window built into a floor, staircases leading to nowhere, doors that open to walls, upside-down columns and rooms built, then intentionally closed off – all to ward off and confuse the spirits that had fallen to her husband’s invention. 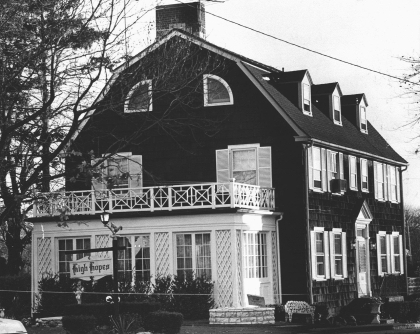 In December 1975, the Lutz family moved into 112 Ocean Avenue, a large Dutch Colonial house in Amityville, a suburban neighborhood located on the south shore of Long Island, New York. Thirteen months before the Lutzes moved in, Ronald DeFeo, Jr. had shot and killed six members of his family at the house. After 28 days, the Lutzes left the house, claiming to have been terrorized by paranormal phenomena while living there. In 1977 Jay Anson would publish a book based on the Lutz’ experience. Some of the paranormal activity mentioned in the book include swarms of flies in mid winter, levitation, vivid nightmares, and hidden rooms stained red. The five bedroom Dutch Colonial was listed by Daniel Gale Sotheby’s International Realty for $1.15 million in 2010. Unlike the previous three haunted homes on this list, Franklin Castle actually looks the part. Built in 1865 for German immigrant Hannes Tiedemann, the castle saw the death’s of Tiedemann’s mother as well as four of his children within a three year period. The nature of the deaths gave rise to rumors of various crimes committed in the house by Tiedemann. The home is rumored to have a variety of hidden rooms and passages that were used for bootlegging during prohibition. The gothic-style castle was sold in 2010 for $260,000 to Oh Dear! Productions. The company has plans to turn the property into a 3-family home. 1600 Pennsylvania Avenue might be the most famous address in the United States. It’s also reportedly home to a veritable who’s-who of ghostly spirits including Abigail Adams, Dolly Madison, Abe Lincoln, Andrew Jackson, William Henry Harrison, and a British soldier from the War of 1812. Lincoln has been the White House’s most social ghostly figure. Mrs. Coolidge reported seeing the ghost of Lincoln staring out of the Oval Office window on several occasions and a young clerk once claimed he saw Lincoln sitting on a bed pulling off his boots.